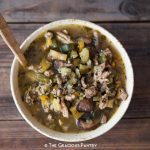 This clean eating slow cooker herbal turkey vegetable soup recipe is fabulous for autumn or any chilly evening dinner. Autumn is about to arrive and I cannot pretend that I am unhappy about it. Here in the blistering (and just a tiny bit humid), triple-digit heat of northern California, the promise of cooler days and falling leaves is always a comforting thought. And while we aren’t there yet, I know many folks are starting to think about it just like I am. Especially with the evenings around here getting just a tiny bit more breezy. We recently had one surprise bout of cold weather in the middle of summer, and I took full advantage of that. It was chilly, I was enjoying it, and I wanted soup! A nice, clean eating, veggie-filled, comforting soup. 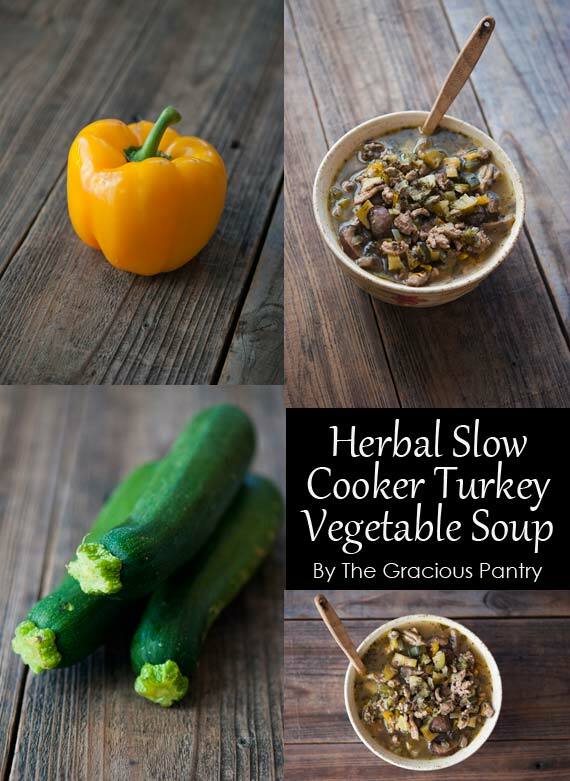 And this Clean Eating Slow Cooker Herbal Turkey Vegetable Soup totally fit the bill. I can’t wait to make it again during a time when I can count on the days being as chilly as the nights! This delicious soup is perfect for autumn and winter. It's brothy, hearty and makes a tummy happy. Using a large skillet, lightly sauté the onions in the oil. Add in the mushrooms, and bell peppers cooking only until the onions are translucent. Remove from heat immediately. Transfer the onion mixture to your slow cooker crock. Using the same pan, cook the turkey just enough to brown it, breaking it up as you cook into tiny pieces. Once browned, add the meat to your crock as well. Add the zucchini, spices and broth to the crock last, and cook on low for 2-4 hours. I have a heart condition that requires me to keep my cholesterol below 100, so I just love the recipes on this site!! They are easy, well thought out meals that are not only good for you, but taste yummy as well. What is the serving size of this yummy soup? Sam – About a cup. 🙂 The yield I sadly didn’t notate and now can’t remember. But just by looking at the recipe, you can probably count on at least 6 cups if not more.